Firefox alone offers the potential to make social networking an integrated part of the browser, with support for the Social API. The API lets social networks add toolbar buttons along the top of the browser and optional side panels to show news feeds, chat boxes, friend requests, and messages. It's just the latest of Firefox's stream of new features continually being added to this independent, truly open-source Web browser. Partly because of its constant improvements and innovations and partly because it's not the product of a large corporation but rather an international open-source-contributed effort, I'm still a big Firefox fan. There's very little that other browsers can do that Firefox can't, and none of them is nearly as customizable. Firefox has lots of HTML5 support, the best extension capabilities, and a unique "Panorama" tab organizer. While you can get all this Mozilla goodness for Windows, Mac, or Linux, I evaluated the Windows version for this review. When it comes to privacy, however, Firefox pioneered the Do Not Track system, though it doesn't offer quite the protection of Internet Explorer 9 and 10's Tracking Protection feature. Memory usage issues, long a bane of Firefox, have been addressed, both in the browser itself and in offending extensions. Another kvetching point has been startup times, but here, too, Firefox has gotten within spitting distance of the fastest browsers. A simple 19MB download gets you the Firefox 17 Windows installer. When you run it you'll lose your old version of Firefox. The latest Firefox is available for Mac (37MB) and Linux (21MB) as well as for Windows 7, Vista, and XP—the last of which even Internet Explorer 9 (Free, 4 stars) can't claim. You can import bookmarks from any other installed browsers on first run, but setup is as uncomplicated as it is for Chrome. Firefox also now makes it easy to choose a search provider other than Google, but surprisingly, not as easy as Chrome does. Mozilla also offers a Firefox with Bing version, which uses Microsoft's Web search built in. Mozilla has been working towards silent updates for Firefox since at least the summer of 2010. And starting with version 15 this effort finally came to fruition—you no longer need to explicitly update Firefox; it happens after a restart of the browser without an interrupting update procedure. The Firefox installation gets around Windows' User Access dialog in a more orthodox way than Google Chrome's automatic updates. Chrome installs in a non-standard, non program folder, which some consider a potential security risk. Firefox, however, uses a "service" rather than a standard program process for the update to avoid the UAC dialog. Firefox's interface is in line with the trend of "less is more"—less space taken up by the browser frame and controls and more space for Web pages. The page tabs have moved above the address bar, and as with Opera 12, there's just a single menu option in the form of the orange Firefox button at top left. You can re-enable the standard menus by hitting the Alt key. Firefox's new-tab page has tiles for most-accessed sites on the new-tab page, and includes lots of settings on its default home page. As in most other browsers, you can customize what's on these thumbnails, and they shrink and enlarge as you resize the browser window. You can also remove sites and pin and unpin them to the new-tab page. But you can't specify which sites to include: They're chosen by frequency of your visits. It's not quite up to the level of Safari's beautiful 3D Top Sites page or Opera's Speed Dial, which even offers live information on its pinned tiles. But with version 18, Firefox now supports Retina dislpays on MacBooks, for crystal sharp images. Most other browsers let you re-open closed sessions—Firefox's default home page lets you do this, but I'd like to see the choice on the new-tab page, too. If you don't want the tile view, a button at top right turns it off, reverting to the plain white, blank tab page. The Home button is to the right of the search bar, and a bookmark button appears to the right of that. That bookmark button only appears when you don't want the bookmark toolbar taking up browser window space. This gives you one-click access to frequently needed Web addresses. But I wish that, like IE's star button, the button also let you see recent page history. You can still call up the full bookmark manager, which lets you do things like importing bookmarks from other browsers, search, and organize. And the full History dialog does let you see all recent visits, but it's not as convenient as IE's star dropdown. Firefox is one of the last remaining browsers to still use separate address and search boxes, which is good for those who like to keep those two activities separate. That doesn't mean, however, that a search won't work in the address bar, aka the "awesome bar." That tool, which drops down suggestions from your history and favorites whenever you start typing, was pioneered by Firefox and copied by all other browsers. Another tweak is that when one of its suggested sites is already open in a tab, you can click on a "Switch to tab" link, preventing you from opening more tabs unnecessarily—a useful tweak. As part of its leading extensibility, Firefox has always been the browser most open to allowing different search providers, including specialized search like shopping, reference, or social. It was one of the first to support the OpenSearch format. The other popular browsers now do so, too, but Firefox can automatically detect search services on a page and let you add them from the search bar. And Firefox's built-in Twitter search option makes it easy to find Twitter personalities worth following as well as popular photos and videos on the social network. 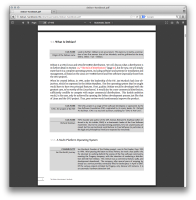 The PDF.js viewer allows users to view PDF files in Firefox without a need for a third-party plugin. The feature has been in development since 2011 and previous versions of the feature have been available in earlier Firefox versions, albeit disabled by default. In those older versions it could be enabled by setting the pdfjs.disabled value to false in the browser's about:config pages. PDF files opened in the new viewer fill the whole browser page; PDF.js can also shows page thumbnails in a sidebar and offers controls to zoom, save and print the PDF file. For developers, the new Firefox desktop version adds an experimental Remote Web Console which can connect to Firefox for Android and Firefox OS web applications and interact with them from within the desktop installation of Firefox. Another experimental addition is a Browser Debugger for add-on and browser developers. Both experimental features are disabled by default. The Android version of Firefox gets theme support, which means that users can personalise their mobile browser by selecting imagery from the Mozilla Theme Directory. Firefox for Android also has its own Google-powered Search Widget where users can search the web with Google and open results in Firefox. The widget can be added by dragging the "Firefox" widget to one of the home screens. With extended ARMv6 support in Firefox for Android, the browser now also runs on the LG Optimus One, T-Mobile myTouch 3G Slide, HTC Wildfire S and ZTE R750 mobile phones. The minimum CPU requirement for the browser has been lowered to 600MHz clock speed. Work on improving performance on resource-limited phones is important for Mozilla as it works to get Firefox OS running on very low cost mobile devices in the future. More details on all changes in the beta release of Firefox 19 are available in the release notes for the desktop and mobile versions. Firefox 19 Beta is available for desktop users on Windows, Mac OS X and Linux from the Firefox Beta channel. Firefox 19 Beta for Android can be downloaded from the Google Play store and can be run alongside the stable version of Firefox. NB. why does FFox assume that everyone used FaceBook? I don't want this integrated into my browser skin. Thanks and I found out I had a problem with the auto update frm a bug involving sys restore. So all is now updated.